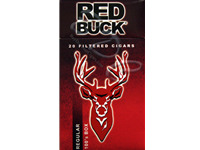 Kentucky burley leaves combined with numerousflavors offer the best smoking experience in the form of Red Buck filtered cigars.Choose Red Buck Full Flavor Filtered Cigars for a mind-bogglingexperience. Great alternatives to cigarettes, these cigars are affordable andpromises delight of supreme order to the smokers. Red Buck cigars are the products of TantusCorporation located in Russell Springs Kentucky. The manufacturer offersmachine-made and quality cigars to its customers. BuyDiscountCigars.com bringsyou the genuine quality through affordable price deals. They are good, and the price and service from this company makes them even better. The Red Buck Full Flavor Filtered Cigars are the best. I enjoy the rich taste quality taste.